When agents cannot perfectly share risks, the economy is subject to wider fluctuations (Acemoglu and Zilibotti 1997). One reason why risk-sharing can be imperfect is because markets are incomplete – that is, markets to insure a given risk simply do not exist. Throughout history, a number of contractual innovations – from the bill of exchange to limited liability – increased the set of traded securities, made markets more complete, and contributed to long-term growth (North 1991). Yet, it is challenging to empirically identify a causal effect of changes in risk-sharing possibilities on real outcomes. In a recent paper, I study the real effects of one contracting innovation that suddenly increased risk-sharing possibilities – central clearing counterparties (CCPs) for derivatives. CCPs are institutions that insulate derivatives traders against counterparty risk, and therefore make derivatives better hedging instruments. The first CCP in history, the Caisse de Liquidation des Affaires en Marchandises (CLAM), was created in Le Havre (France) in 1882 in the market for coffee futures. Understanding the real effects of CCPs is also important for current policy debates. Indeed, after the 2008 Global Crisis, the use of CCPs became mandatory worldwide for a large class of derivatives. The focus of my empirical analysis is on the impact of central clearing of trade flows in coffee. Did better hedging possibilities change the geography of trade flows in physical commodities? To answer this question, I use archive data to reconstruct bilateral trade flows in coffee and other commodities throughout Europe. For identification, I use three sources of variation: (i) before and after 1882, (ii) between Le Havre and other European markets where clearing is not introduced, and (iii) within Le Havre, between coffee and other commodities that remain uncleared. As a control group, I use a number ‘colonial commodities’, including cocoa and tea. The main empirical result is that, after central clearing is in place, coffee trade flows in Le Havre increase significantly, relative to other harbours and to other commodities. Le Havre became a more important hub for coffee trade Europe-wide. It imported more coffee, warehoused it significantly more, and re-exported it to other European harbours when needed. 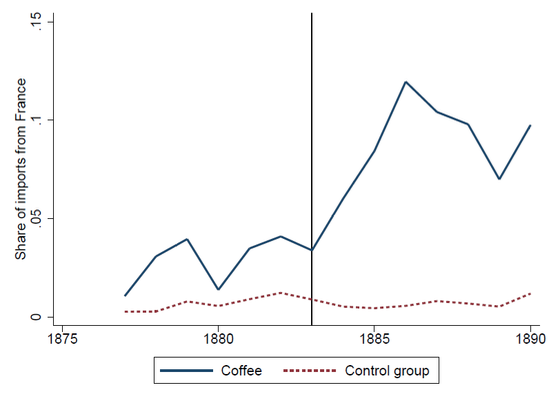 As Figure 1 shows, with the example of the Netherlands, other European countries started to import more coffee from France (and specifically from Le Havre) after central clearing was in place. I then replicate the main findings with other commodities that subsequently became cleared, primarily cotton and indigo, and I confirm my main findings. These econometric findings are also supported by narrative evidence. Many contemporaries wrote that the CLAM boosted trade in Le Havre and, within less than ten years, nine other European futures exchanges had introduced CCPs. Therefore, the contractual innovation quickly spread. What is the precise mechanism that explains the increase in trade flows? First of all, I show that the creation of the CLAM coincided with a significant increase in the degree of market completeness. Indeed, the creation of the CLAM was a response to a global crisis that severely disrupted coffee trade worldwide in 1880. There is significant evidence that counterparty risk had become a key concern. Moreover, the CLAM was explicitly designed to mitigate counterparty risk, with high equity, high margin requirements, and a chairman of the board with a strong reputation of honesty. 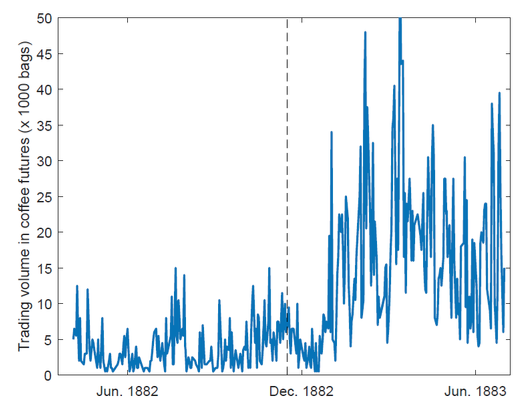 Consequently, as seen in Figure 2, the creation of the CLAM coincides with a boom in futures trading – many more risk-sharing instruments were traded. I then use transaction-level data to document evidence of two distinct effects. For well-established traders, I show that the main effect of central clearing was to solve a ‘missing market’ problem. In sum, the risk of long-established traders was known, but their counterparties could not previously hedge such risks. Instead, for new traders, I show that asymmetric information was preventing entry before central clearing was in place. Afterwards, the share of new traders – which are more subject to adverse selection – increased. Furthermore, there was also significant entry of new coffee traders in subsequent years. Therefore, the mechanism through which central clearing affected trade flows was not the same for all traders. Finally, I rule out alternative channels that could explain my results. Specifically, I show that my results cannot primarily be due to an increase in price transparency, or to an increase in contract standardisation, which both occurred with the creation of the CLAM. Indeed, clearing with the CLAM was not mandatory. Therefore, if traders were primarily valuing either price transparency or contract standardisation, they could have enjoyed any of these two benefits in the exchange, while not using costly central clearing. Instead, there is strong suggestive evidence that the vast majority of transactions were centrally cleared. Therefore, the effect is specifically linked to the creation of the CCP. While central clearing proved beneficial when first introduced, one should remain careful when drawing implications for current debates about mandatory central clearing. There are at least two novel elements to be taken into account. First, central clearing in the 1880s was voluntary. Instead, mandatory clearing may create new agency problems, since CCPs now have more captive clients and potentially benefit from implicit guarantees. Second, the CLAM closely resembled a member-owned institution. In contrast, for-profit CCPs – which are now common – may be less inclined to manage risk so as to avoid externalities that impair the market’s functioning. Acemoglu, D, and F Zilibotti (1997), “Was Prometheus unbound by chance? Risk, diversification, and growth”, Journal of Political Economy 105: 709-751. North, D C (1991), “Institutions”, Journal of Economic Perspectives 5: 97–112. Vuillemey, G (2018), “Completing Markets with Contracts: Evidence from the First Central Clearing Counterparty”, Working paper.